The 2nd Meilleur Ouvrier de France (MOF) competition was held at Parc Floral in Bois de Vincennes located in the southeast of Paris. MOF was established in 1913. The honor of being awarded the MOF in France is believed to be the equivalent to Japan's Living National Treasure. The selection criteria include a candidate's goals and vision appropriate to the national artisan of excellence in the grooming area, such as his/her work experience as a groomer and the career path he/she wishes to pursue in the future, not to mention excellence in grooming techniques. Martial Carré was awarded the MOF on this occasion. Basics of grooming were put on show at the Pet Esthé stand, where Véronique NERY demonstrated massage techniques with the application of thalassotherapy, aromatherapy etc. Véronique completed the Gold Class Diploma Course officially accredited by The Pet Esthé International Association France at the seminar organized by AUDRECO in March. The 5th India International Pet Trade Fair (TIPTF) was held at the NSIC Exhibition Center located in the suburbs of New Delhi, India from 21 to 23 January 2011. 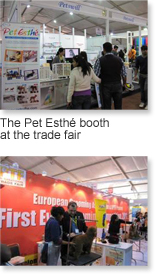 Pet Esthé expanded its business to India for the first time this year and exhibited at the trade fair. The Pet Esthé booth was visited by large numbers of people interested in Nail Colors and Vivid Colors; this popularity was reported in The Times of India, the largest circulation Indian newspaper. The Pet Esthé booth also had instructors from grooming schools, the owners of pet salons and technicians interested in innovative Pet Esthé products including the Color Restoration System and received a very large number of questions and inquiries. 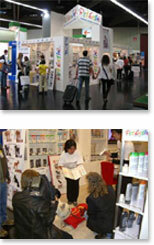 Our company exhibited at Interzoo 2008, the world’s largest pet product exhibition, in Nurnberg, Germany for the third time, following 2004 and 2006. It was a great success, as many customers from all over the world visited our booth every day. 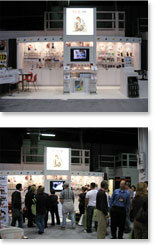 Pet Esthé booth: customers from 44 countries visited. Pet Esthé was interviewed by various media. As the Color Restoration products are the only ones of their type in the world, they received the high attention and appreciation from many customers. Many customers visited our company booth at the SuperZoo, which was held at the Mandalay Bay Convention Center in Las Vegas from September 18 to 20, 2007, and showed great interest in our products. 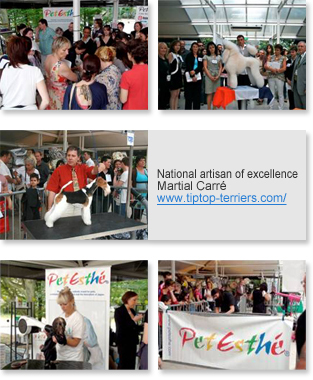 In the grooming contest, in which many groomers competed, works which used our company’s Vivid Color were chosen for the Grand Prix, and also won second and third prizes. 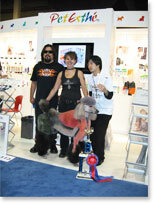 Our products were highly evaluated by the SuperZoo attendees, and gained many fans. Many customers visited our company booth at the H.H. Backer Show, which was held at the Convention Center in Rosemont, Chicago, and showed great interest in our products. Many groomers and agencies showed considerable interest in our Color Restoration System, which is the first rejuvenation system for pets in the world. Our products including Color Restoration System's products, were at the top of the cover page of the pamphlets distributed at the show. We were interviewed by magazines, newspapers, and T.V, stations from many countries, and we were highly evaluated in many fields.